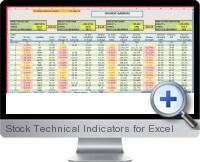 Excel Stock Technical Indicators (XData) provides historical daily data for over 3,000 US stocks and ETFs as well as technical indicators calculated from the data. With a variety of common technical indicators for trading systems already calculated, the stock data can be quickly used for back testing and executing daily trading strategies. Volume trending analysis shows and isolates opportunities for US stock positions by monitoring and ranking the performance of predictions based on share volume movements over time. Access to data for stocks and ETFs listed on the NYSE, Nasdaq and OTCBB exchanges. Ability to download raw daily data and technical indicators with price/volume charts and trend analysis. Stock technical indicators cover price momentum, volume trends and volume movement metrics based on varying period constant lengths. Volume momentum indicators include highest gains versus 10 day volume change, on balance volume indices, positive/negative volume trends and variable period moving average trend analysis. Additional advanced indicators for the stock data include relative strength index, exponential moving averages, pivot analysis, resistance and support indicators, Fibonacci pivot points, Bollinger bands and volatility risk metrics. Data is stored on the cloud and can be accessed from versions of Excel for all devices including Office 365 with OneDrive integration or sent directly to a designated DropBox folder.